TBILISI - Georgia will reduce its diplomatic staff in its embassy in Moscow, Foreign Minister Eka Tkeshelashvili said on Wednesday, a day after Russia recognized the independence of two Georgian breakaway regions. "We are downgrading diplomatic relations with Russia. Only two diplomats will remain working in our embassy in Moscow," Tkeshelashvili was quoted by Georgian news agency Caucasus Press as saying. Russian President Dmitry Medvedev on Tuesday signed decrees recognizing the independence of South Ossetia and Abkhazia, which broke from central Georgian rule during wars in the early 1990s. Medvedev said recognition "is the sole chance of saving people's lives" after the recent clashes in South Ossetia. Georgia sent in troops to reclaim South Ossetia earlier this month, triggering a military offensive by Russia. France, which holds the rotating presidency of the European Union (EU), brokered a ceasefire agreement between Georgia and Russia. 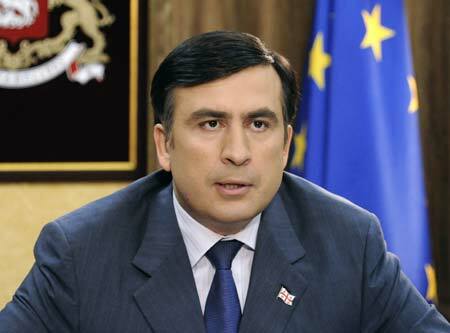 Saakashvili was quick to take a swipe at Russia's move on Tuesday, saying it is "in direct violation of international law." But he urged Georgians to stay calm and vowed a peaceful struggle to defend his country. Georgia, a former Soviet republic in the Caucasus, has long been at odds with Russia over the two breakaway territories and Georgia's bid to join the transatlantic NATO alliance and the EU. Georgia has already recalled its envoy to Moscow in July after Russia admitted to sending fighter jets into Georgian airspace. Ties with Russia had nosedived in September 2006, when Georgia briefly detained five Russian soldiers on espionage charges, which Russia strongly denied, prompting Moscow to recall its ambassador to Georgia.